In the heart of Old Havana, we can find a very unique and cheerful place. This sauce is basic to Cuban cuisine because it is the basis for ensuring the distinctive flavor of their food. This is a Cuban classic and makes a wonderful marinade for meats and poultry. Traditionally this is made with sour oranges. Make it Now and Enjoy it! This recipe, Shredded Beef (Ropa Vieja) is a classic Cuban dish, and one of the most popular. This is the perfect recipe for those who love the flavors of a classic Cuban pork roast but are cooking in small quantities. 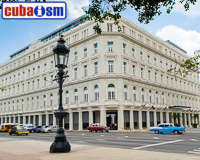 The Gran Hotel Manzana Kempinski La Habana has come to initiate a new era in Cuban tourism. Catalogued as the best five-star hotel on the island, and co-managed by the brands Kempinski (Switzerland) and Gaviota S.A. (Cuba), the Manzana brings a new touch of glamour to the city. Its high-rate services and staff, the elegance of the building itself and the goal of promoting a first-class Old Havana experience, make of this hotel something unique at the very heart of the city. Visit our Hotel Manzana website for more details.